Following three separate derailments within one week of resuming operation in the Batticaloa-Valaichenai stretch of the Colombo-Batticalo service, the train service to Batticaloa has been temporarily suspended, sources in Batticaloa said. The service to Batticaloa was resumed with much fanfare on the 12th after a lapse of seven years with Transport Minister Upali Piyasoma joining the maiden trip from Polonnaruwa to Batticaloa leg of the journey. The train that took part in the maiden voyage, derailed in its return journey back to Colombo. 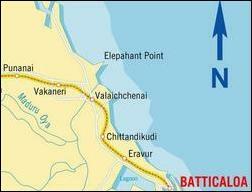 The last derailment occurred near Eravur on the 15th which prompted the authorities to suspend the service on the Valaichenai-Batticaloa stretch. Railway authorities are also considering instituting a reduced-load 2-car service on this stretch to minimize the possibility for further accidents, but no firm decision has been taken on this matter. Officials also said that it will take a minimum of two weeks to completely repair the 32-kilometer badly installed stretch that lies between Batticaloa and Valaichenai.